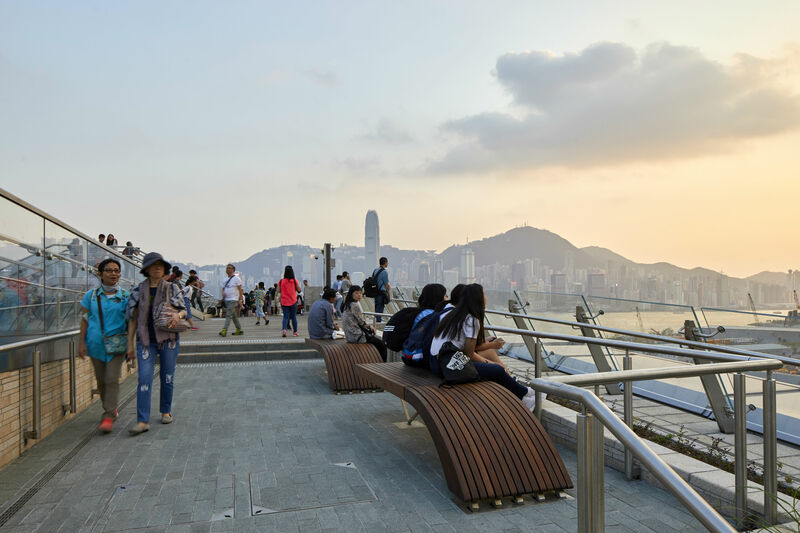 The view from Kowloon – looking across Victoria Harbour to the skyline of Hong Kong island and its highest point, the Peak – just got better. 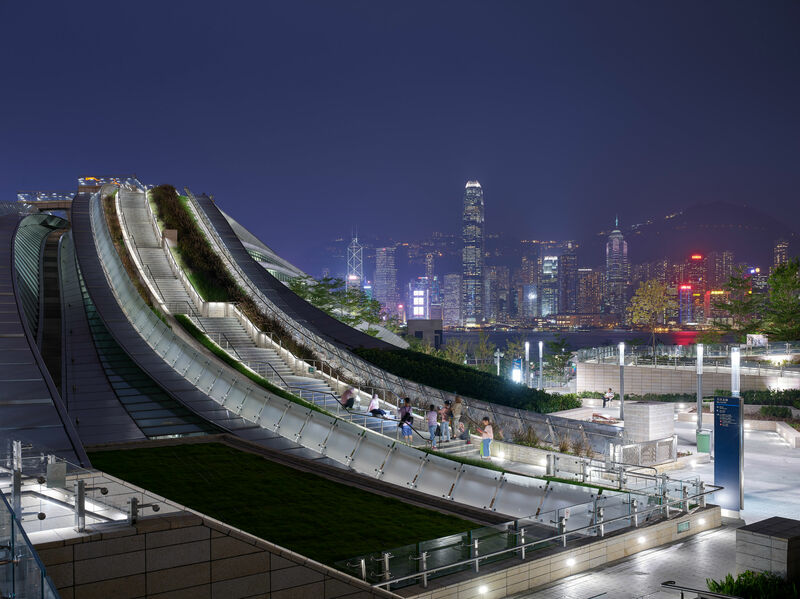 Now you can see it from a garden walk that climbs 25 metres above ground, and even higher above a vast, breath-taking new rail terminus called West Kowloon Station. 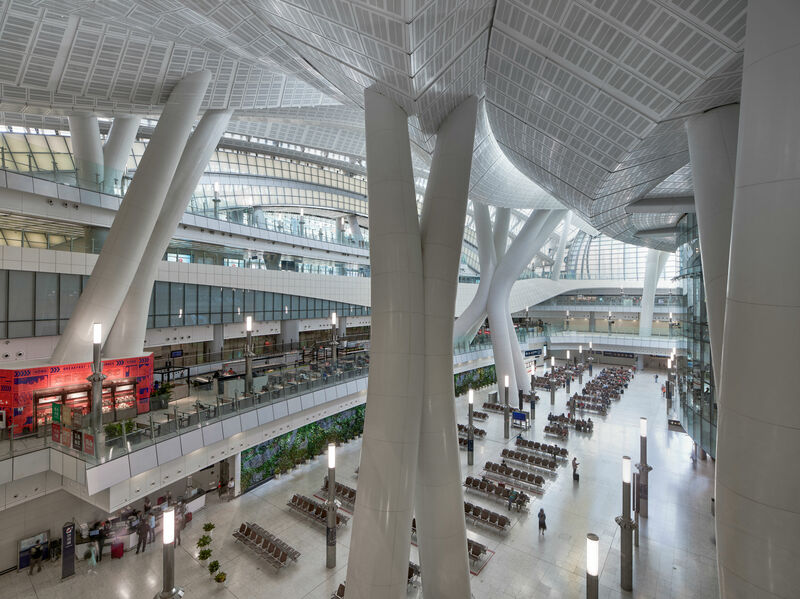 With an area of over 400,000 square metres, its internal drama of space and structure makes West Kowloon Station one of the most extraordinary stations in the world. The three hectares of public realm above and around it are not just an urban oasis, but an adventure in three dimensions. The new station also plays a key – and controversial – role in integrating Hong Kong into the People’s Republic of China. Hong Kong (which includes Kowloon) was returned to China in 1997, but it remains a separate, autonomous territory; the former British colony was the key to igniting the economic explosion of the Pearl River Delta region under Deng Xiao Ping’s 1980s reforms. 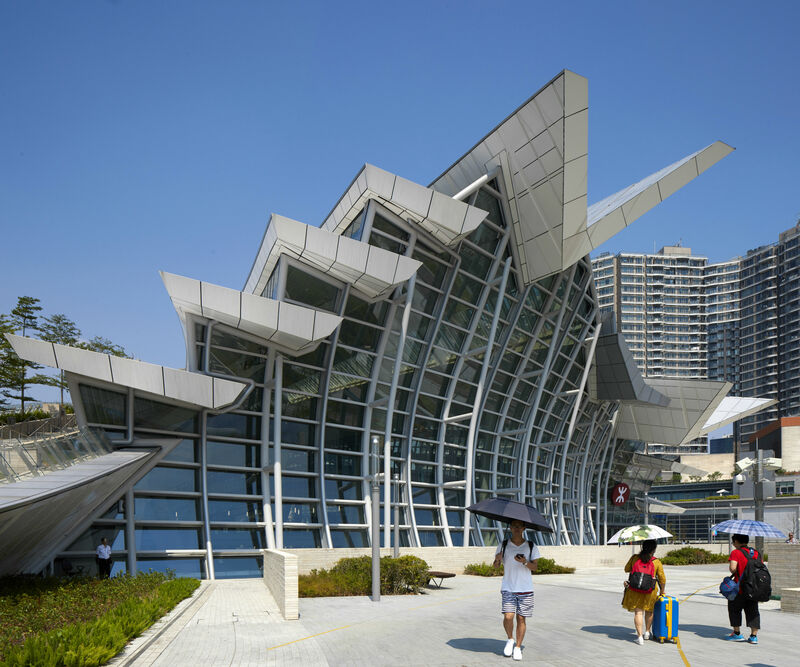 Now, it is connected to its two mega-city Mainland neighbours of Shenzhen and Guangzhou via China’s High-Speed Rail (HSR) network, and you can even take the HSR all the way to Beijing – and these journeys start at West Kowloon. 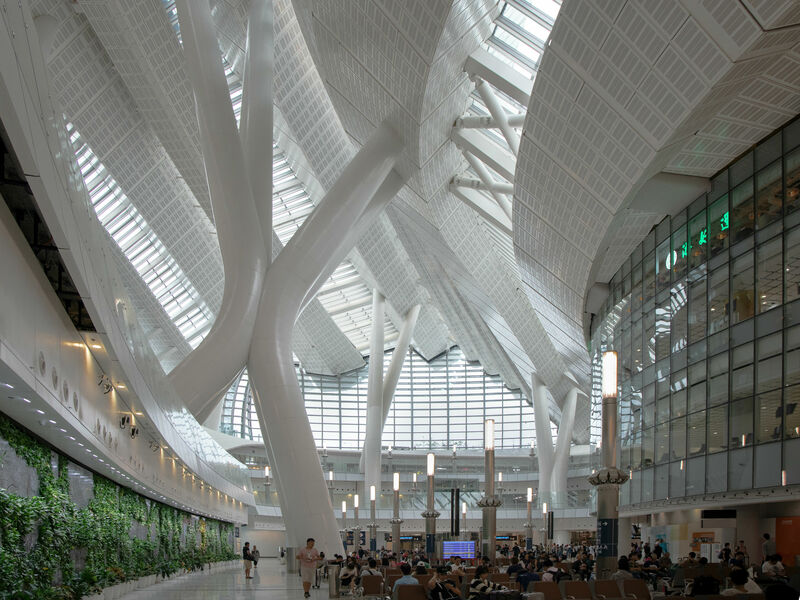 The station’s architect is Colorado-born Andrew Bromberg at Aedas, one of the ten largest architectural practices in the world. His realised works include the North Star mixed-use development in Beijing (completed 2010), the haunting, not-quite-twin gothic arch-shaped Boulevard Plaza office towers (2011) in the downtown Dubai district, and Sandcrawler (2014), a horseshoe-shaped building on piloti housing Lucasfilm’s headquarters in Singapore. Bromberg's adventurous play with form was a key factor in Aedas winning the architectural competition for West Kowloon in 2009. Construction started the following year and was targeted to complete in 2015, but after problems including tunnels flooding, the terminus finally opened in September 2018. Including a 26km tunnel to the border, the project cost HK$84.4 billion (around £8 billion), which was a third more than originally envisioned. The forces converging at the station informed the design; they include wind (a key consideration for large buildings), pedestrian flows, traffic… and not least, trains. There are fifteen platforms 25m below ground on the lowest level of the station, B4; to accommodate train types such as the Vibrant Express, six of these platforms extend to over 200m long. The two levels above, B3 and B2, are Departure and Arrival concourses. These concourses feel like an airport terminal – clean white anodyne spaces with stretches of retail – and the departure portals to the tracks are even called ‘gates’. The levels include areas of passport clearance, which are under Chinese jurisdiction, as are the platforms and the trains themselves. This was controversial at the outset, because it gives Mainland China a toehold in Hong Kong territory – but there are precedents, such as French and British border controls on each other’s territory with the high-speed Eurostar link. Moving up, we reach level B1, which is Ticketing. A mezzanine floor on this level hosts a branch of the Michelin-rated restaurant Tim Ho Wan; above this is the ground floor, where a new access road runs along the eastern side. This is the station’s formal entrance; it faces the local Metro station Austin, which is also connected by two underground passages and two footbridges from the first floor level. 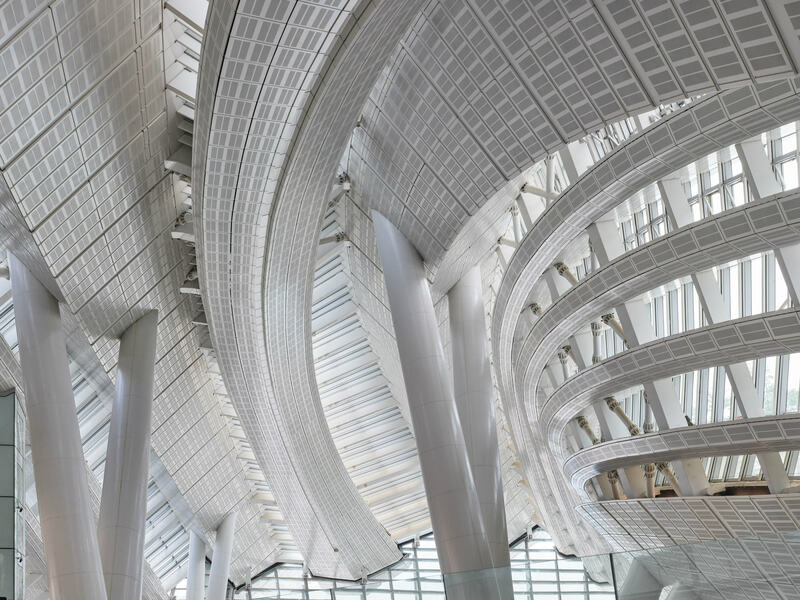 Stepping through the glazed entrance, West Kowloon Station presents a long balcony that places you directly at the edge of an epic spatial drama. The heart of the station is a vast emptiness – a void that stretches to a full length of 180m and rises up to 45m. Its base is a vast open concourse on level B3, with 100m of green wall integrated into an artwork by Qiu Zhijie: Map of Hong Kong Culture. Above it, the void touches the cutaway edges of terraces along B1 and B2, and rises upwards to a sweeping, soaring curved roof; this is key to the passive energy performance of the station, with cool air sinking to its lower levels. The roof is also part skylight – 4,000 panes of glass fill the station with light. Part of Bromberg’s inspiration for the roof was railway tracks, apparent in the mullions of the skylight glass strips, like rail-track sleepers. These transparent bands alternate with solid structure: three arches, spanning north to south. The eastern-most arch defines the formal entrance. It also absorbs forces originating from the very lowest levels – pulses of air pressure from arriving trains, which need to be dissipated. Other arches carry elements of the sky-garden above; looking up at these long solid arcs, they give an almost giddy sense of rotation as they reduce in height on the western side, as if they were parts of a great spinning top. Like a cathedral, massive support columns enable the station’s enclosure of space. They are white, grouped in five clusters, and emerge off-vertical at their base in pairs, before branching towards the roof; they look like chromosomes magnified to gargantuan dimensions. The central support is a cluster of four columns, two of which emerge visibly at level B3. From certain angles, the column-bundles can evoke the impression of being in a forest, but one with the scale of giant redwoods. Stepping outside, we see how West Kowloon Station’s eastern arch defines the long road-side entrance facade. It could have echoed the semi-circle facades of great railway barrel-vaulted station sheds from the nineteenth century, but for the intervention of an enclosed footbridge connection with Austin station. It looks like an airborne train has plunged through the centre of the facade’s great arc of glass and got stuck there. Around the corner at the southern end is more glazing – a curving, concave wall which rises from the ground to a jagged, stepped roof. Its edge is the end of roof elements sweeping north across the station’s void, three of which form dramatic V-shapes along the top. The whole facade might even suggest a dragon’s jaws opening upward from the ground. The fluidity of the structure’s form and the way its elements curve as not-quite-parallel, organic strands, becomes clearer to the west. Here, the roof slopes down, and the solid roof arcs carry the so-called Sky Corridor across it; this comprises of two stepped walkways, each like a path across a large but gentle hill. Bromberg’s interests include hiking, and they Sky Corridor's walkways offer a hike with an unusual reward at the top – boardwalk viewing platforms and seating at their highest points. They’ve already begun to generate a flow of Sky Corridor instagrams. Below the paths, a line of trees in 1.5m of soil also arcs across the roof; the rooftop territory is just the highlands of the expansive new public realm. There are curving terraces of green arranged beyond and below the Sky Corridor; parkland and a hard-surfaced, landscaped civic plaza extend west towards an adjacent skyscraper citadel, which includes the iconic KPF-designed 484m-high ICC tower. To the south is the broad view across the harbour, framed on the Kowloon side of the water by key cultural buildings of the emerging West Kowloon Cultural District — the new Xiqu Centre, a performing arts centre designed by the late Canadian architect Bing Thom, and to the west, the M+ museum by Herzog and de Meuron, expected to open later in 2019. Across the border, Mainland China continues to build HSR stations on a similar scale, but they are unlikely to match West Kowloon Station. Its fantastic form and its simply staggering internal spaces are unique; no other station anywhere will lift you through green, civic space to that view over Victoria Harbour.